Subsea-Cloud is a technology to efficiently move offshore survey data from the field to the office via cloud services. 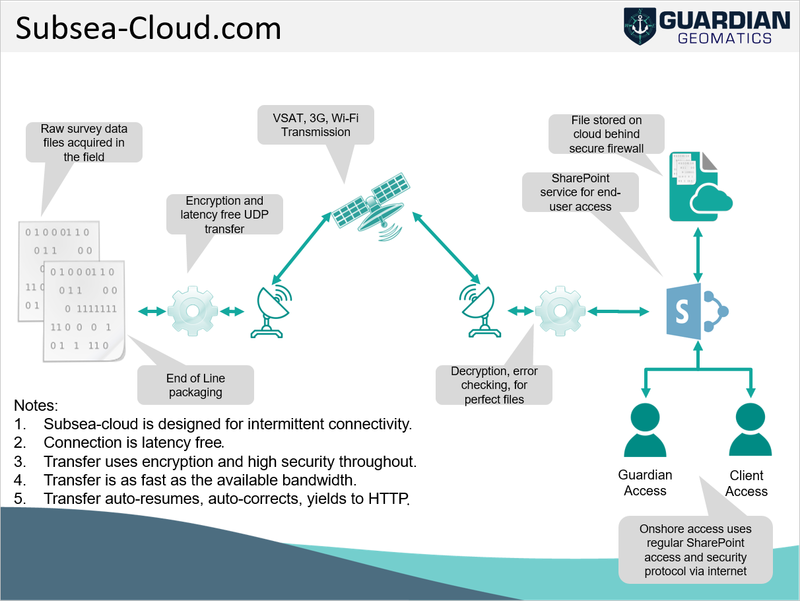 A subscription based service designed specifically for offshore survey operations, where conventional (and excellent) data transfers such as FTP, Dropbox, Onedrive, GoogleDrive struggle to deliver across and high latency, low bandwidth environments. Remote offshore operations promise to deliver many benefits, and as our team have been heavily involved in using SSC technology for more than 8 years, our service provides the benefits that come from having real-world experience, over purely theoretical benefits. 1. The most tangible and immediate benefit (i.e. a real value) is to lower an offshore project HSE profile. HSE risk is measured by complex algorithms arising from exposure hours in the field. Reducing exposure hours is the most fundamental mechanism as it eliminates the risk entirely for personnel no longer required in the field. 2. Subsea-cloud is a low risk stepping stone to unmanned field operations. Taking a step-by-step approach to remote operations and reduction in manning is better manages the risk of being short-staffed in the field. Subsea-cloud closes the tyranny of distance and isolation between the field and the office. With a reliable, efficient and seamless link, we can plan and implement automation in a thoughtful and considered manner. 3. Final data delivery commences on day 1. One of the most common frustrations in the offshore survey business is the delay between final delivery of data and report. With no delay the duration is typically between 30 and 60 days. With delays it can become 90-120 days. 4. Subsea-Cloud enables end clients to make smarter decisions while operations are underway. Traditional field campaigns were based on a waterfalls approach of plan-execute-check-report. Detailed upfront planning was essential and often based on a set of assumptions such as weather, environmental visibility, anticipated production rates. By receiving data in near real-time, the project team in the office can use agile methods to adapt the survey to actual production rates and actual environmental factors. A good example is weather. Bad weather impacts an operation through rough seas, causing the survey platform to become unstable, reducing data quality. Conventional wisdom requires the team in the field to determine if the weather is workable. The vessel often goes down on weather for a couple of days resulting in no production until the weather is considered acceptable. History shows that the personnel in the field may not be in the best position to determine if the data quality is acceptable or not. They are not the end user, so can only work from specification sheets. A more agile approach is to get the data to the end user as fast as possible, even if it is not final quality data. The end-user can then assess if it is acceptable, or what the next course of action can be, which is a range from - continue to work, slow down, reduce line spacing, change survey line orientation, or go down on weather. Subsea-Cloud often reduces project duration by optimising the survey plan during the survey. It also provisions flexibility for additional work to be added to the scope. Either way, the decisions become optimised and agile. Transfer is bi directional. Data can be sent to the cloud from the vessel, and the office can upload new data, revised plans and quality control feedback to the vessel. For multi-vessel operations, one boat can send data to another vessel, thereby synching vessels. Proven to work with 2/3/4G, fleet broad band, Ku band, Ka band and C band. Secure cloud storage as the Azure platform ensures the highest possible level of security for your data. Pay as you go model. Subsea-cloud is available as a project cost rather than capital expenditure. These modest costs are easily accounted across the project. Optimized for point cloud (XYZ), Multibeam (.ALL, .S7K, .GSF), Sidescan Sonar (.XTF, .JSF) and Sub Bottom Profiler (.SGY) and UKOOA file formats (.P190, .P294).